This morning I did a foliar application of seaweed, humic acid, b-vitamins and liquid fish. Lows tonight are forecasted for 35 degrees here in Midway. Scary close to freezing and we tend to be a couple of degrees cooler than the forecast. Foliar kelp can help reduce frost damage. I will spray some more on this evening. Nighttime lows haven't been very good, even though the daytime highs have been in the low 90s lately. We haven't been above 45 degrees at night for the low since the plants got out of the hoop houses. That obviously slows down growth. Winds have been a constant challenge each day as well, but that is standard. The wind fence next to the 1974 patch seems to be helping. Right now one section of the fence is open on the windy corner for access to the backyard as I landscape, but I should be able to close that up today which will help. I noticed my son's plant seems to be relatively protected with that wind fence. Regardless of the challenges the 1974 plant is growing very well. I looked at photos of past seasons around this same date and I've never had a plant this large by this date as this 1974 plant. It is early and there isn't a pumpkin growing, but it is a seed I would recommend. There is a female at the tip that I'm guessing we will be pollinating around Friday or Saturday of this next week that will be at about 14 feet on the main vine. That would be perfect. That plant is going to explode in size over the next week and will be sufficiently big enough to start growing that pumpkin. 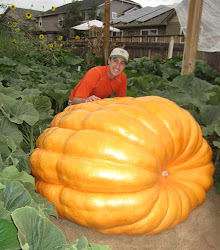 That would put the pumpkin at 105 days old. About the maximum number of days a pumpkin would grow, so it gives enough time to get everything I can out of that plant before the weigh-off. The 2145 plant isn't growing quite as fast, but growing as it should. It has a female at about 10 feet that should be ready to pollinate around Wednesday or Thursday of this next week.